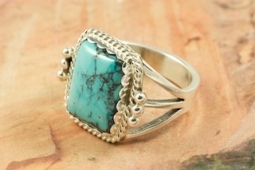 Genuine Candelaria Turquoise set in Sterling Silver Ring. The Candelaria mine is located in Esmeralda County, Nevada. Candelaria Turquoise is very rare and extremely hard to come by. Created by Navajo Artist Justin Morris. Signed by the artist. Ring is 3/4" L x 3/4" W.